Field Agent™ is the App that Pays You! 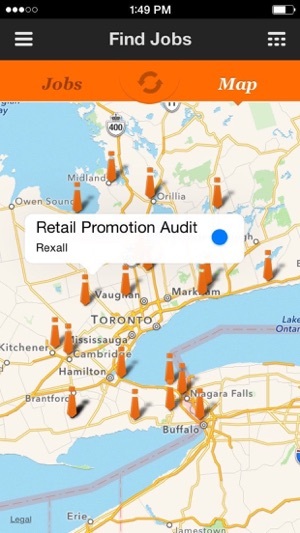 We have Clients across Canada that need information from places you go every day, like your local supermarket. 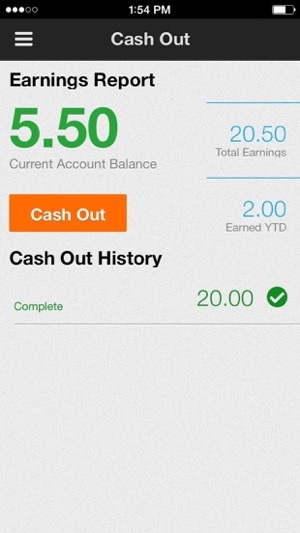 Our App pays you to report specific pieces of information to our Clients via the Free Field Agent iPhone App. Everyone is eligible to become an Agent, simply download the App and create an account! 1. One of our Clients logs onto ca.FieldAgent.net and creates a job. 2. Our system prices the job and releases it to Agents in the field. 3. The first Agent to accept the job has two hours to complete it. 4. Once the information is found, entered and submitted, the Agent receives a memo credit for the value of the work in their ca.FieldAgent.net account. 5. If the information was accurate, that memo credit becomes a permanent deposit within 48 hours and is available to be transferred to the Agent’s PayPal account. 6. The Client has the information they needed and the Agent made a few extra dollars. Mission accomplished! A common example of one of our jobs is an item price check with a photo. The App will instruct you to go to a local store, find a specific product, take a photo of it on the shelf and enter its price. This type of job is easy to complete, but is very important to companies who need insight on their item or a competitive item at retail. Never before has information been so accessible at an affordable price, thanks to technology and capable users such as you. Another simple job example is a survey. Our Clients often need the opinion of consumers just like you. Surveys are distributed in the same method as other jobs, except you can complete the job and make money from any location. Survey jobs are popular, so act fast to reserve them. • Jobs typically pay between $3 and $12 each. • The money you make with Field Agent is real. We do not deal in points or pennies; we pay you real dollars. This is how it works: the money you earn is stored in your Field Agent account at ca.FieldAgent.net until you decide to withdraw it. Withdrawals are handled through any standard PayPal account. You determine when and how much to withdraw on ca.FieldAgent.net and we transfer the money for you. We even cover the PayPal fees so it costs you nothing. • Field Agent Rep Scores are determined by reliability and accuracy. To maintain a high Rep Score, only accept jobs that you can complete within the time limit and always be sure to enter accurate information. 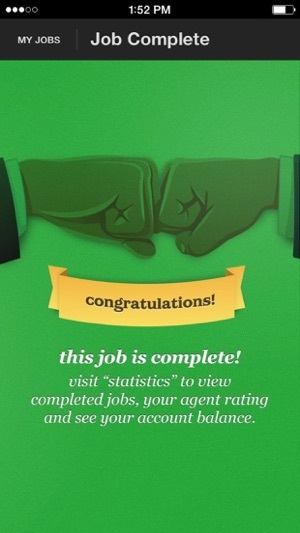 All Agents start with a Rep Score of 85, but each accurately completed job adds 1 point. Uncompleted jobs cause you to lose a point and inaccurately entered information causes you to lose 5 points. • Except for surveys, jobs are typically dependent on your verifiable GPS location and usually require you to take a picture with your iPhone as confirmation. This helps ensure the accuracy of information and keeps our Clients happy so they come back with more jobs for Agents like you. 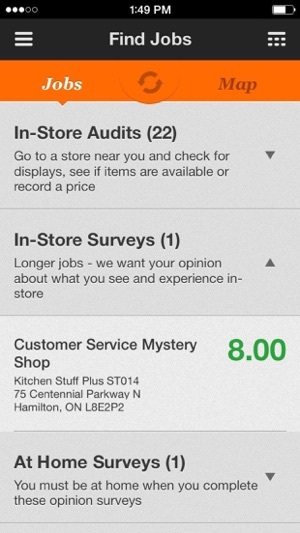 • iPod Touch users are able to participate in surveys, but not location dependent jobs. This is due to the need for photo and GPS confirmation to validate the accuracy of the information they provide. People using this app need to know that they can choose to not pay you and suspend your account based on their clients perception of things. For example, there were multiple jobs in my area to do tobacco mystery shops at 7-11. The task was to walk in, take a picture of the 2% milk section (to validate you were in the store), walk up to the counter and ask for a pack of "Next Blue King Size" and if they provided you the pack with the correct advertisement about not smoking on it, they passed. If it was any other picture they failed and you leave the store. At no point did you have to buy the cigarettes. Afterwards you take a picture of the sign outside as additional verification you were at a specific store. In my area, I did 7 of these jobs in a row (they paid $6.75 each) and it just so happened that they all failed the mystery shop. I thought this may seem odd so I sent an email to Field Agent advising of the situation - just in case. Shortly after that I received notifications that the last 6 of those 7 jobs were declined because the manufacturer believed there should be a 90% success rate. Not only did I not get paid for the 6 jobs, but they suspended my account based on the fact that the manufacturer was suspicious of the data I was sending. I no longer am able to do jobs or receive payment for the ones they owe me for. Customer service interactions each time (Field Agent employee was Jeff Doucette) ended with "sorry, our hands are tied". DO NOT WASTE YOUR TIME WITH FIELD AGENT!